The Fujifilm X-T3 is a mirrorless camera featuring a 26 megapixel X-Trans BSI CMOS 4 APS-C sensor, high-performance X-Processor 4 image processing engine, 3.69m dot resolution electronic viewfinder, and a three-direction tilting 1.04m dot LCD touchscreen and a robust weather-resistant magnesium alloy body. 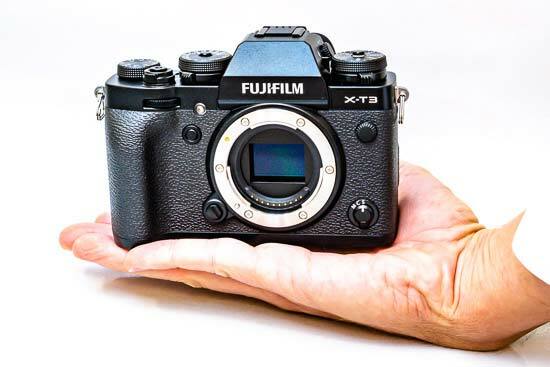 The X-T3 also offers 4K/60P 4:2:2 10bit video recording, 30fps continuous shooting with the electronic shutter or 11fps with the mechanical shutter, 425 auto-focus points with 100% coverage of the phase detection AF area, more accurate and faster Eye Detect AF, the ability to focus down to -3EV, and support for dual SD memory cards. The Fujifilm XT3 is available now in black or silver and costs £1349 / $1599 body only, or £1699 / $1899 with the XF 18-55mm kit lens. The new Fujifilm X-T3 looks almost exactly the same as its popular predecessor, the logically named X-T2, but inside it's all change as Fujifilm have upgraded virtually all of its core components. From a handling point of view, the end result is a faster, more capable camera that's the best X-series model that we've used to date. 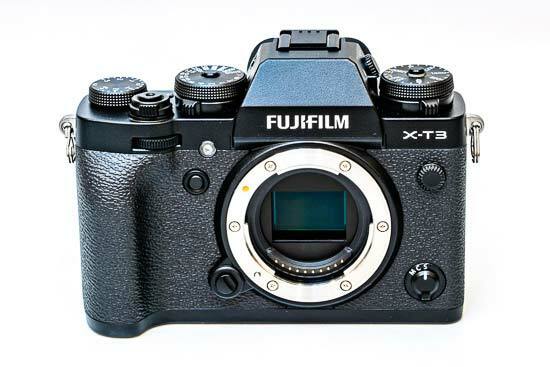 If it ain't broke, don't fix it, seems to have been the strict design rule that Fuji's engineers have adhered too, so two years after the X-T2 comes its doppelganger, the X-T3. This is in no way a criticism of the latest model - we, and many other photographers, loved the handling of the X-T2, so if there's little to improve, why tinker with the design? Having said that, there are a few fairly significant changes. The Fujifilm XT3 now uses a 4 piece construction – top, front, rear and bottom - rather than 3 piece as on the X-T2, whilst the diopter control has been made lockable and the EV compensation dial has been moved further into the middle of the top panel, both changes made to stop those controls from being accidentally knocked out of position. Attention to detail or what?! A completely new and very welcome addition is the 3.5mm headphone jack on the left-hand side of the body, which on the X-T2 was only available via fitting the optional battery grip. The terminal port cover can now be completely removed from the camera body, a feature implemented at the request of videographers, whilst quite a lot of the main buttons and controls on the camera have been made slightly larger than on the X-T2, bringing this new version more in line with the flagship X-H1. Speaking of which, the new XT3 in many ways equals or even out-performs its bigger, more expensive sibling. The key difference between them is worthy of note, though - the X-H1 offers in-body image stabilisation (IBIS), whereas the new X-T3 doesn't, just like its predecessor. We do like the effective IBIS system offered by the X-H1, but it does make that particular camera quite a lot bigger than the X-T series, and quite a lot more expensive too. On the rear, the Fujifilm X-T3 has exactly the same high-resolution 3 inch LCD monitor as the X-T2, which offers 100% scene coverage and 1.04 million dots, and can be usefully tilted up and down by about 90 degrees when in landscape mode and upward when shooting in portrait mode by releasing a small switch on the edge of the screen. 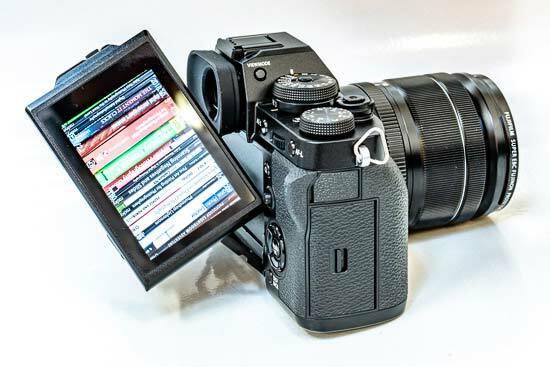 The main difference is that the 3-inch 1040K-dot LCD screen on the X-T3 is now touch-sensitive, which means you can use it to set the AF point or even fire the shutter release if you want when shooting stills or pull focus when recording video. On the right-hand side of the screen you’ll see a small icon, which if you press it allows you to choose between using the screen to choose the AF area, autofocus, or to have it both autofocus and then take the picture. If you prefer, you can turn off this functionality altogether, but it’s much quicker than using the buttons to set the point. Furthermore, you can actually change the focus point whilst holding the camera up to your eye by dragging across the touchscreen with your right thumb, with the option to use the whole screen or one of six different areas. Again, it's a little tricky to get it right at first, but persevere and it soon becomes more natural, if not quite second nature. The ability to use the touchscreen becomes very welcome when you realise that you can literally touch anywhere within the frame to focus. The Fuji XT3 is one of the few cameras on the market to offer 100% coverage of the phase detection AF area, allowing you literally focus anywhere that you want. There are 425 AF points in total, and 2.16M PDAF pixels, up from 0.5M on the X-T2. The X-T3 can also focus down to -3EV when used with particular (but not all) lenses, which is a significant improvement on the X-T2's -1EV rating. The X-T3 also offers more accurate and faster Eye Detect AF, a de rigueur feature pioneered by Sony and now appearing in most new cameras. This feature is available in the AF-C as well as AF-S focusing mode, and although it's not quite as tenacious as Sony's proven system, it did increase our hit count with faster-moving or more erratic subjects where trying to focus more conventionally would produce fewer keepers. The X-T3's burst shooting capabilities also help considerably - how does 30fps sound to you?! Even better, that headline-grabbing rate is with full AF/AE metering and is completely blackout free between frames, achieved by using the electronic shutter and maintaining the live view at 60fps, making it perfect for action photography. The main caveat of the 30fps mode is that the camera automatically enters the Sports Viewfinder Mode and applies a 1.25x crop factor, dropping the resolution from 26 down to 16.6 megapixels, although there's also a benefit in that you can still see outside the cropped area, allowing you to predict where the subject is moving into the frame. Still, I think this is a small price to pay for such a blazing fast burst rate, and if you do want the full resolution, the X-T3 can shoot at a "slower" 20fps without any cropping, or 11fps using its mechanical shutter, both again with full AF/AE metering and without the need for the external battery grip, which the X-T2 relied on for its fastest rates. To help you with capturing the precise moment, the Fujifilm X-T3 has a clever new Pre-shot burst shooting mode, a feature that Panasonic cameras have had for a while now. Essentially the camera constantly fills the buffer while your half-press the shutter button, and then keeps the most recent ones taken 0.5-1 seconds before a full press of the shutter button, thereby eliminating any camera and human-added delay. 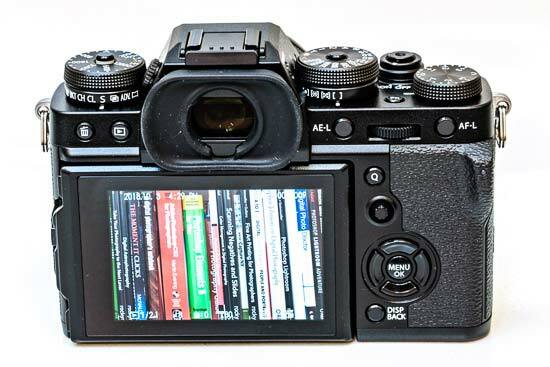 Note that this feature only works with the electronic shutter. 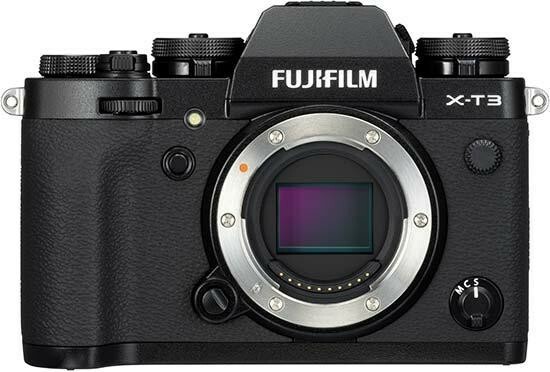 Powering all of these cool new features is the hot new quad core X-Processor 4 image processor, which Fujifilm say is 20x faster than the original 2012 X-processor in the X-Pro1 camera, and 3x faster than the one in the X-T2. In addition to all of the improvements that we've already discussed above, the powerful new processor also enables features like 14bit RAW files, the new colour chrome effect, much improved video functionality (more on the in a minute) and longer battery life, now up to an official CIPA rating of 390 shots per charge (versus 330 on the X-T2). 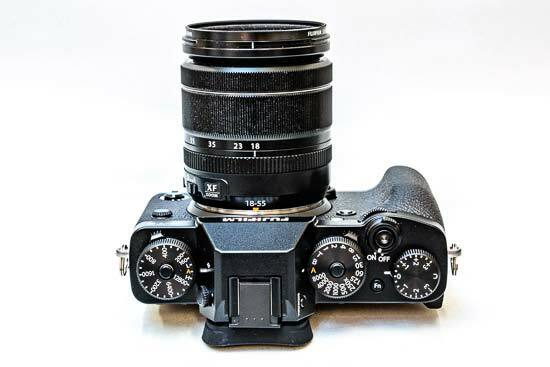 At the heart of the Fujifilm X-T3 is a new 26 megapixel X-Trans CMOS 4 sensor. This is the World’s first BSI APS-C sensor with copper wiring and will allow Fujifilm to develop f/1.0 super high speed lenses in the near future, such as the 33mm optic that's on the X-series roadmap for 2019. The clever new BSI sensor also promises to deliver better image quality in low light / long exposures (check out the Image Quality and Sample Images pages to see for yourself), and it has allowed Fujifilm to implement a new base ISO speed of 160 on the X-T3, with the ISO range being extendable down to ISO 80 and up to 51200. The X-T3 has a higher-resolution electronic viewfinder than its predecessor, now offering 3.69 million dots versus 2.36 million dots on the X-T2. The magnification has dropped slightly though from 077x to 0.75x, although you'd probably be hard-pressed to tell the difference. The EVF on the X-T3 has an automatic brightness adjustment function and a fast 100fps frame rate when turning the Peformance Boost mode on (60fps when it's off). 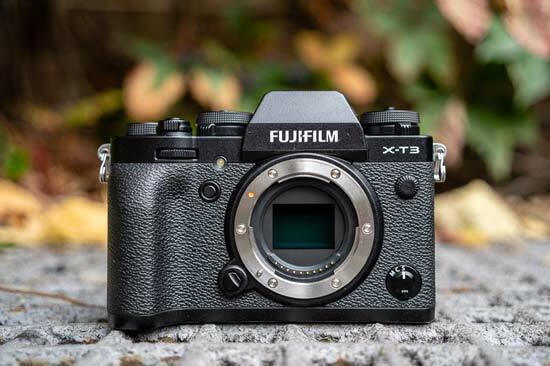 Switching from stills to video, the X-T3 is the most capable X-series camera that Fujifilm have ever released. It offers the World's first 4K/60P 4:2:2 10bit video (with a 1.18x crop) for any mirrorless camera, available recording when out over HDMI, and it can also record 60fps at 4:2:0 10bit quality internally. The X-T3 can also record 4K/60p internally whilst simultaneously sending the feed to the HDMI port, so you can record footage both internally to an SD card and to an external HDMI recorder at the same time if you wish. Other video improvements offered by the X-T3 include 17msec rolling shutter, 12 stops dynamic range, 2 stops better high sensitivity than the X-T2, up to 400Mbps bit rate, an FHD 120fps mode, a new Eterna cinema mode, the same upgraded AF system as for stills, new Zebra setting, and 30 min recording time for both 4K and 1080p. In addition, 4K HDR mode will be enabled via a near-future firmware update. All in all, Fujifilm have certainly pulled out the stops to make the new X-T3 one of the best mirrorless cameras for shooting both 4K and 1080p video. The X-T3 benefits from the welcome addition of Bluetooth LE connectivity. This allows you to transfer images from the camera to a smartphone, even when the X-T3 is turned off, allowing for much more convenient transfer and sharing of your images. Note that you must install the free "FUJIFILM Camera Remote" app on your smart device to use this function.